I never really did get into any Star Trek series after the original. Maybe I was ruined by the action of the original, or the overacting of Shatner, or the 60's beauty of the green aliens, but none of the following series fired my phaser. That's why the new series of classic figures from Art Asylum has had such a prominent spot on my shelf. They produced the first wave last summer with great sculpting and articulation, and I've been looking forward to the second wave ever since. 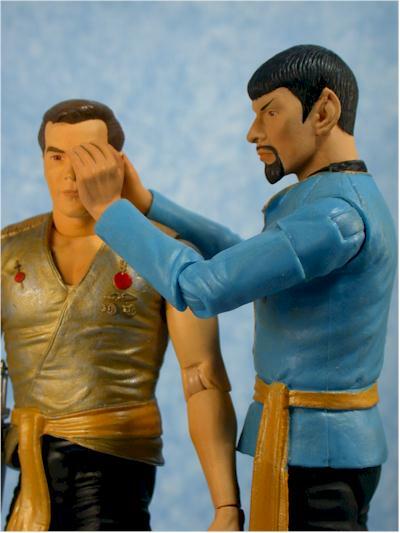 It includes the Mirror Mirror versions of Kirk and Spock, and the regular versions of the rest of the bridge crew - Sulu, Chekov, and Scotty. These are popping up at Gamestops first, but should be hitting other retailers soon. The third wave has been announced, including an Orion Slave Girl, Salt Monster, Klingon, Gorn, and yellow shirt Kirk (the one that was previously exclusive only). That wave will help round out the display quite nicely! 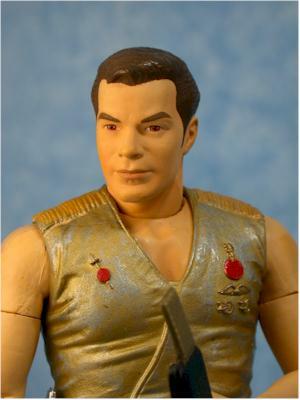 2016 Update: With the renewed interest in original Trek, and terrific 1/12 figures from Mezco and 1/6th figures from Qmx, it seemed appropriate to reformat this review. The Art Asylum series remains one of the best in this scale, even after all these years, and it remains affordable, with most figures still in that $20 - $30 range. 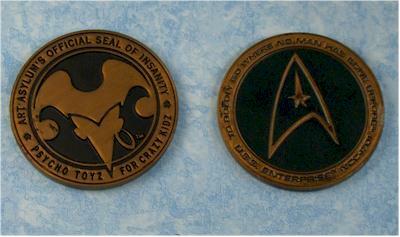 The card backs have a inventive design, based on the Star Fleet symbol. They are also fairly attractive and colorful, but man, they are impossible to pack away for the MOC collector. Fortunately, they don't take up too much more space than they have to. The head sculpts vary a bit depending on the character, but some of these are tougher to capture than others. 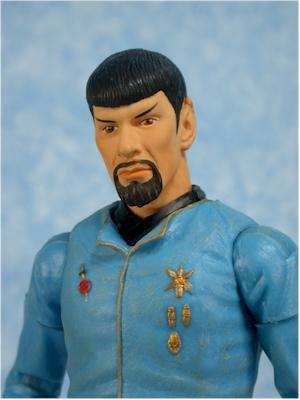 My favorite of the set is the Mirror Mirror Spock. Every aspect of this sculpt is dead on, but the head sculpt is truly impressive. 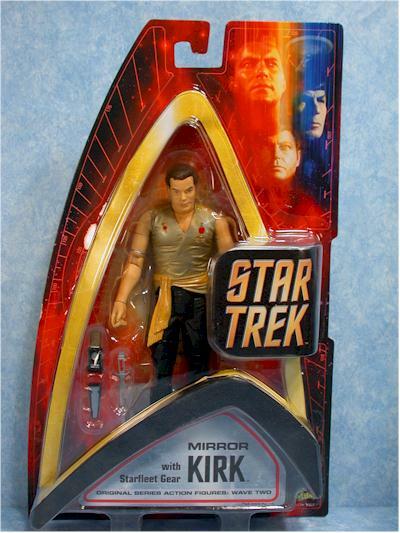 They captured Nimoy perfectly, but he has a more obvious facial structure. 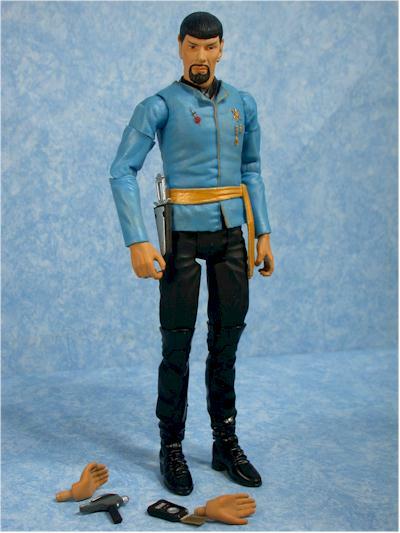 Scotty and Sulu are also surprisingly good, and Sulu has an advantage over all the other figures - his legs are positioned farther apart. The others are sculpted to be very close together, and it actually hurts the overall appearance of a couple of them. 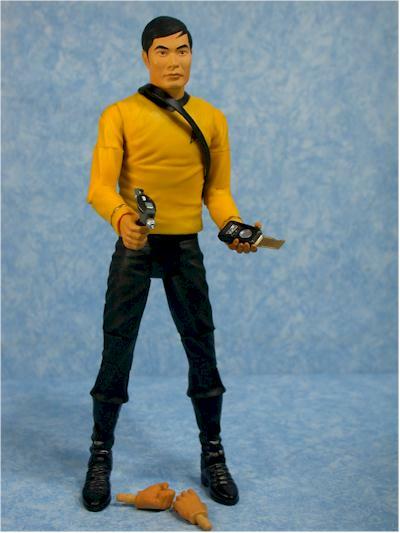 But Sulu has a nice wide stance, and that helps make up for the lack of ball jointed hips. Chekov suffers the most from the close legs, due to a slightly bent ankle on mine. His sculpt is also the farthest off, although it's not more than a smidge. 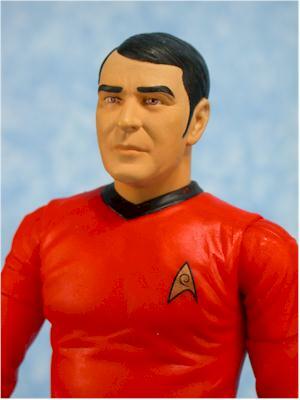 Kirk has that same issue - the sculpt is *soooo* close, but there's something slightly off. Some folks have complained about the scale, but I think it's pretty damn close. 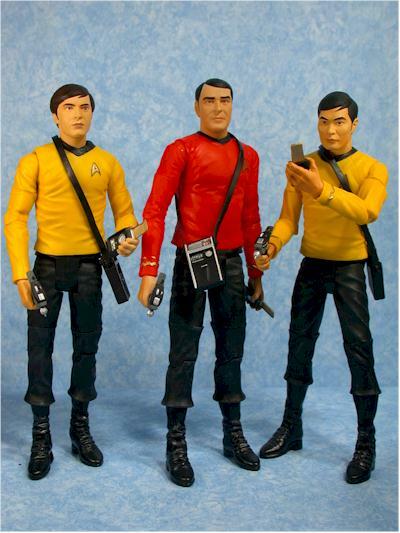 Sulu and Chekov are slightly smaller, and Spock is appropriately taller. Shrinking things down often throws people off though - remember, in this scale a whole three inches in real life is less than half an inch! Also, big differences in smaller scales are often way too obvious, so while it might sound good, it often looks funny. The paint application is excellent on every figure, without exception. The skin tones are clean and consistent, and they used a variety of finishes on the black to imply different materials between the boots and pants. 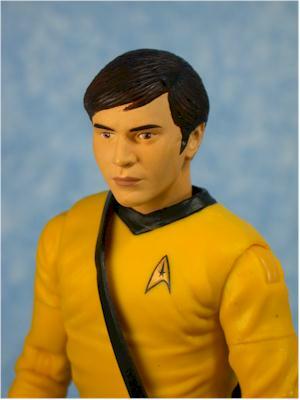 There's even a slight difference in the skin tones of Scotty, Sulu and Chekov - it's not a huge difference, but enough to notice. The soft rubber shirts can get dirty easily though, so be very careful handling them. Nothing that washing your hands once in awhile won't fix. The majority of the detail work is in the faces and accessories. All the small areas are done with precision, and there wasn't a single case of crossed eyes or wandering pupils. I did have to drop the score a half star though due to the differences in shirt colors between these and the first wave. I'm color blind and I can tell, so you know they aren't quite right. The big problems are between the red of Scotty's shirt - a bright red - and the red of Uhura's dress - a darker red, and the the yellow of Sulu and Chekov compared to Yellow Shirt Kirk. They don't match up well, and they should be exact. For some this might not be a big deal, but at this price (and considering Trek fans), it was important for them to get this detail right. These figures are extremely well articulated, although there's a couple key points that hold them back from a perfect score. Each figure has neck (ball jointed), ball jointed shoulders, cut biceps, elbows, wrists, waist, hips, knees and ankles. The bicep joints are a little weak on a couple, but it's most noticeable on Kirk, with his bare arms. The gapping can be fixed if you play around with them a bit, but is distracting. Most of the rest of the joints work well, and are nice and tight. I had no trouble getting them all to stand on their own, but the aforementioned narrow stance on most of them means they can't do too many poses below the waist. The lack of ball joints at the hips cuts the number of lower body poses quite a bit. All these figures come with a pack of accessories, most more than the first series. Every figure comes with a plastic 'coin', embossed on both sides. The detail and paint work is great, but I'm not sure what the purpose of an accessory like this really is. Collect them all, trade them with your friends? 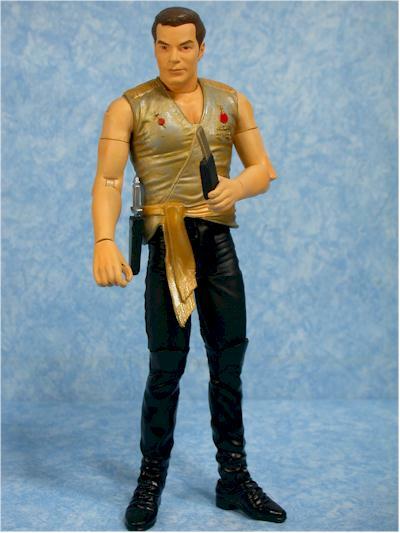 Mirror Mirror Kirk is the only one that's a tad light, coming with just the communicator, knife and sheath. The knife fits in the sheath, but it's a tight fit. The sheath attaches to the soft rubber shirt with a peg through a hole, and it works extremely well. 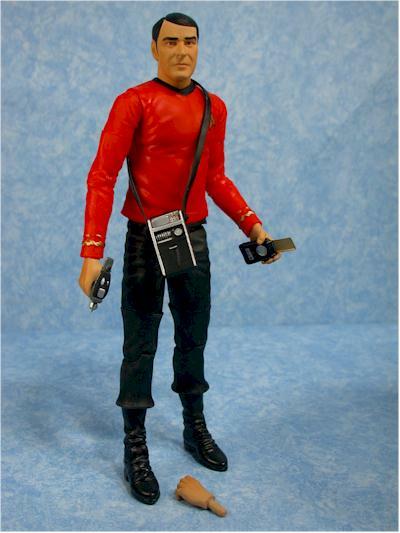 Mirror Mirror Spock comes with the same communicator, knife and sheath, but also has a phaser and an extra set of hands. I believe these hands are positioned for the alternate universe mind meld, but I haven't watched the episode in ages. The hands pop on and off easily, much better than Art Asylum's early attempts with the Crouching Tiger, Hidden Dragon figures. 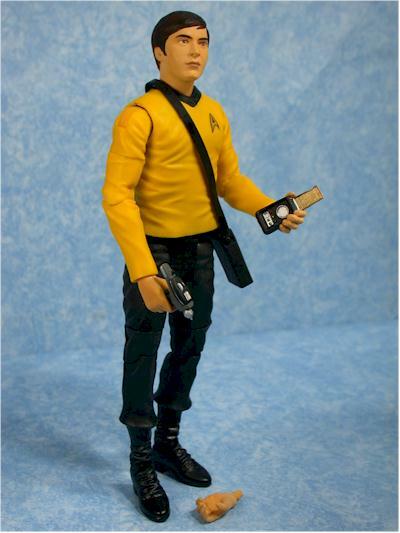 Chekov, Sulu and Scotty come with almost identical accessories - a communicator, phaser, and tricorder, plus at least one extra hand. 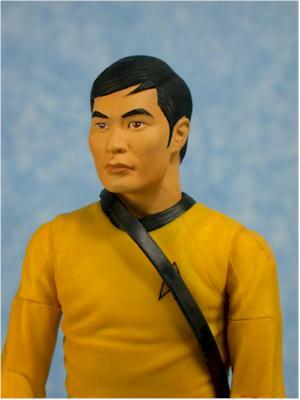 Oddly enough, Sulu comes with a second hand, but watch for it carefully - mine was packaged in a little bag against the card, not in the bubble tray. Some of the extra hands seem identical to the originals, so I'm not sure why they are included, and there is a lot of reuse across the wave. But at least most of the figures have 3 or 4 accessories, which is a reasonable number all things considered. Kids who love the old show can have a great time with these. The accessories are fairly sturdy, but you can expect to put the straps back on the tricorders fairly often, and the knives would be easy to snap. The articulation works great, and the figures themselves are solid and durable. Now we just need that third wave to get a few more aliens! I believe these are running around $13 at Gamestop, a tad steep. I paid $60 (plus shipping) for a set of 5, so the math whiz in the group can tell you that's about what I forked out as well. Considering what we're getting from some companies in the $10 range, these are a couple bucks too much. The inclusion of the Mirror Mirror figures in this set really sets it apart. While there's nothing technically wrong with the other three bridge members, they aren't exactly the most exciting characters. I'd complain if I didn't have them - they're all necessary - but now that we've got the bridge crew complete, it's time to hit the cool aliens in a big way! - has the set of five for $50, a much better price, or you can buy the Mirror Mirror figures individually. You should also the Search Reviews page, in case any other applicable reviews were done after this one was published.